Only two copies of the Magna Carta exist outside Great Britain. One is in Australia and one is in New York. Southby's is auctioning off the New York copy. In the year 1215, a group of English barons handed King John a document written on parchment. Put your royal seal on this, they said. John did, and forever changed the relationship between the monarchy and those it governed. The document was the Magna Carta, a declaration of human rights that would set some of the guiding principles for democracy as it is known today. While that original edict was initially ignored and John died the next year, its key ideas were included in other variations over the next few decades, most notably the right of Habeas Corpus, which protects citizens against unlawful imprisonment. 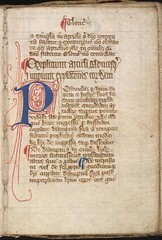 More than 800 years later, about 17 copies survive, and one of those, signed by King Edward I in 1297, will go up for sale Dec. 18 at Sotheby's. Lindsay at Majikthise would really like the New York copy, which is expected to rake in $20 to $30 million. That probably won't happen, but we can all settle for reading it here.